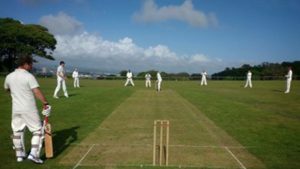 Match report MTECC V Exeter Erratics CC – Season Finale. The sun shone on a warm late September day, for what was probably the latest chronological start to a cricket match at Barrow Park in living memory. 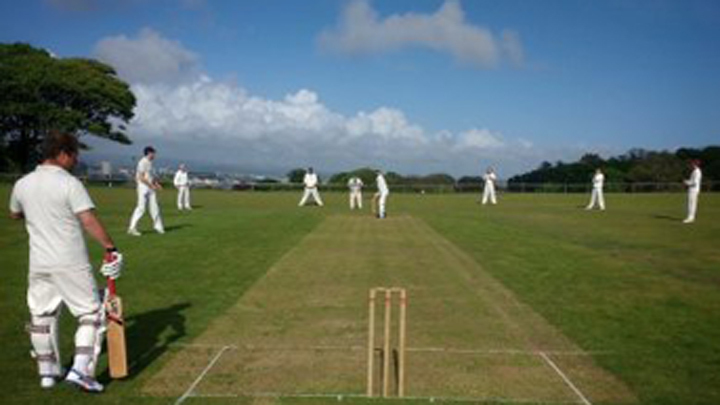 With a drying wicket that had been baked all week under late summer sun Mt Edgcumbe won the toss and elected to bat first. Ben and I opened with a good steady start, and taking advantage of some loose bowling saw the score progress without alarm to 49. The introduction of Cook for Erratics in the 13th over changed things, and he got a breakthrough with my wicket for 21. In the next 13 overs we collapsed a little and lost 6 wickets for 45 runs, leaving us at 94 for 6 in the 26th over. Cook finished with 4 wickets for 9 runs in 7 overs, including Dave for 4 and Micky for 1. Ben carried the batting on his own for a while before he too fell to Cook for 39. Wes and Tom Vowler scoring 0 and 4 respectively, both fell to Cockburn who took a wicket in each of his first 2 overs. With 60 minutes left to bat we were somewhat in the mire when George and Angus came together at the crease. After a watchfully cautious start both played themselves in and we passed 100 in the 30th over. With good running and some lusty striking of the ball the score steadily grew. Cockburn became increasingly erratic and with a flurry of boundaries, byes, wides, no-balls, and no-ball boundaries went for 38 runs in his last 4 overs including, perhaps unsurprisingly, 21 runs in his last. By this stage George and Angus had reached 50 for the 7th wicket partnership. Despite some miserly bowling from Greaves who only went for 15 runs in 8 overs, they pushed on and attacked the returning opening bowler Youngman (there’s no need to feel down). After a leisurely tea, thanks to those involved in it they know who they are, we took to the field. Against a useful Erratics batting line up 178 was still about 25 runs behind par, but was far better than we’d been looking at during the drinks break. Angus and Paul opened and despite plenty of dot balls the boundaries seemed to be coming all too frequently, as the offside slashes seemed to evade all the fielders. Erratics progressed to 48 for 0 in the 10th over. The bowlers were changed, Tom bowled very economically with no luck and pegged back the run rate considerably. In his first over Micky tempted the opener Pullan (31), to drive hard to Ben who took a good catch at short extra cover, 57 for 1 in the 15th over. Not much happened for about an hour until Micky got a second wicket in the 27th over, 92 for 2. This brought Erratic’s best batsman Ferro to the crease. Despite some tight bowling from Dave the opener Williams got to his 50, before being immediately bowled by Ben in his first over. Ben took another in his second over and at 121 for 4 with 10 overs remaining we had a chance. However Ferro held firm and accumulated runs, opening bowler Krups hit some boundaries. With no luck with any LBW appeals and a good diving leg side take by yours truly (pressed into keeping duties again) probably off the glove but ruled not out, the score inevitably crept up. With only a handful of runs needed ‘Tony’ Lewis Baskerville was brought on to have his first bowl for the club. His second ball was hit by Krups (25) straight to Micky at cover and he had his first wicket. ‘Trevor’ Bailey Baskerville bowling at the other end immediately tempted Greaves to hit high into the leg side, Lewis was under it waiting for the catch, and without going into too many details, the ball ended up going to the boundary to win the game for Erratics. Chris Ferro finished not out, again, with 39 runs. Exeter Erratics finished on 180/5 in 41.1 overs. We tried hard and bowled well, conceded only 3 wides and a leg bye, but against useful Erratics batting ultimately never generated enough chances to win the game with the score we had set.